Please contact us at DOPS@virginia.edu if your academic institution, interest group or professional research organization would like to invite the faculty individually or collectively, to speak about their research. There are no public events scheduled for the UVA DOPS faculty at this time. Please check back here for announcements regarding the details of future public lectures and presentations. March 14th, 2019, 6:00-7:30 pm, Vail, CO. Dr. Jim Tucker presented: “Life Before Life: Extraordinary Cases of Children Who Remember Past Lives”, at the Vail Symposium. This program explored the various features of this worldwide phenomenon., Dr. Tucker described numerous cases from our research collection. Common features in the cases include a child talking about a past life at a very early age; behaviors that appear connected to that life, such as phobias related to the mode of death and sometimes birthmarks or birth defects that correspond to wounds the previous person suffered. The presentation included a review of the research and the details of recent American cases. November 10th, 2018, 2:30-3:30 pm, Phoenix, AZ . Mind & Life: International Symposium for Contemplative Research, 2018. Dr. Kim Penberthy participated in a collaborative panel presentation titled: “Off the Cushion and into the Streets: Diversity and Inclusion in Contemplative Science.” Dr. Penberthy co-presented with Martin Davidson of the UVA Darden School of Business, Michael Swanberg of UVA Public Health, and Dallas Ducar of the UVA School of Nursing. October 27th, 2018, 10:00-11 am, UVA Alumni Hall, Charlottesville VA.
Dr. Jim Tucker presented “Children’s Memories of Previous Lives”. Dr. Tucker presented his research of recent American cases of children who remember previous lives to a group of UVA alumni. August 31, 2018, Bellevue, WA, IANDS 2018 Conference: Explore the Extraordinary-The After effects and Gifts of NDEs , August 30th-September 2nd. Dr. Bruce Greyson delivered the keynote presentation for the IANDS 2018 Conference. Dr. Greyson’s talk was titled: “WHY NEAR-DEATH EXPERIENCES MATTER: CHANGED LIVES AND CHOPPED LIVER”. April 12, 2018 Paramount Theater, Charlottesville, VA, Seventh Annual Tom Tom Founders Festival. 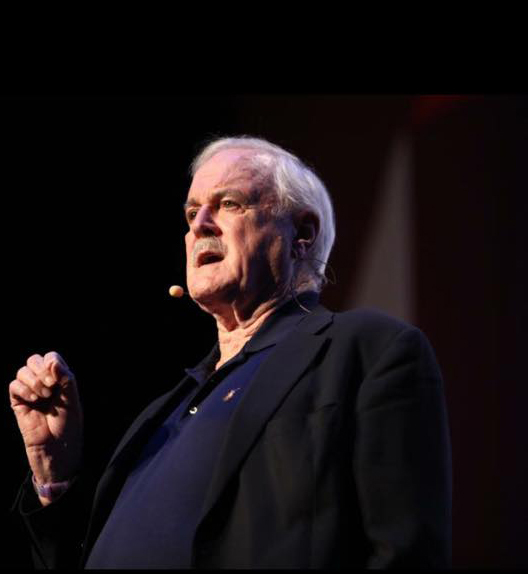 On April 12th, legendary actor, writer and comedian John Cleese, friend and supporter of the research being done at the UVA Division of Perceptual Studies, acted as moderator in a 90 minute discussion of an overview of the scope of the research being done at the UVA Division of Perceptual Studies. In this panel discussion the UVA Division of Perceptual Studies research faculty convened to present an overview of the research to which they have dedicated their academic careers. The DOPS panel presenters were: director of UVA DOPS, Jim Tucker, MD; Ed Kelly, PhD; Emily Kelly, PhD; Bruce Greyson, MD; and Kim Penberthy, PhD. Click here to see the video of this event. April 11th, 2018, Paramount Theater, Charlottesville, VA, Seventh Annual Tom Tom Founders Festival. John Cleese, generous friend and supporter of our research, did a benefit performance for DOPS! This was a special appearance by the legendary John Cleese in a solo performance as part of the 7th annual Tom Tom Founders Festival, 2018. The proceeds from the performance benefitted UVA Division of Perceptual Studies research efforts. The faculty and staff here at UVA DOPS are most grateful to all who came out to support us! All of us here at UVA DOPS extend our heartfelt gratitude to the inimitable Mr. John Cleese for his generous support of the research being done at the UVA Division of Perceptual Studies! The DOPS research faculty had the opportunity to present at the UVA School of Medicine Medical Center Hour , February 2017, to commemorate 50 years of research into the question of post-mortem survival of consciousness. To view a curated collection of other lectures by the DOPS research faculty, please see our UVA Division of Perceptual Studies YouTube Channel. November 30, 2017 @ 12:00 pm – 1:00 pm Radio Interview NPR-The State of Things – North Carolina Public radio, WUNC. Dr. Bruce Greyson discussed his research into Near Death Experiences on the The State of Things – North Carolina Public radio, WUNC. WUNC is North Carolina’s premiere public radio talk show and is broadcasted on 17 stations across the state. This program is heard by more than 410,000 listeners each week. Click here to the link to the Podcast of this informative recent interview. November 12, 2017, 2:35 pm, London, England. 6th British Congress on Medicine and Spirituality, Dr. Jim Tucker presented his research on “Birthmarks and Children’s Memories of Past Lives”. August 19, 2017, 10:00 am, Richmond VA. Central Virginia IONS Community, Dr. Jim Tucker presented his research on “Children Who Report Past-life Memories”. July 22, 2017, 9:30 am, Oakland, CA. Institute of Noetic Sciences 17th Biennial Conference: The Science of What Connects Us. Dr. Jim Tucker and Dr. Arnaud Delorme presented their research, “What happens to “me” after my body dies?”. June 26th, 2017, 7:00-8:30 pm, Sherwood, MD, “Sherwood Seminar”. Members of the DOPS Faculty presented their research on post mortem survival of consciousness. The University of Virginia’s Division of Perceptual Studies (UVA-DOPS) is the only university based research group devoted to the investigation of near-death experiences, children who remember previous lives, and other psychic phenomena. Celebrating our 50th anniversary of this research at UVA, faculty members from UVA-DOPS, presented their work at the “Sherwood Seminar” to discuss their science-based research and the implications for mainstream science and society. June 15, 2017, 12:00 pm, Roanoke, VA. Grand Rounds, Department of Psychiatry and Behavioral Medicine, Virginia Tech Carilion School of Medicine. Dr. Jim Tucker presented his research on “Children Who Report Memories of Previous Lives”. June 16, 2017, 9:00 am, New Haven CT, Yale University, 36th Annual Conference of the Society for Scientific Exploration. Dr. Edward Kelly presented on the topic of “Science and Postmortem Survival”. June 9, 2017, 6:30 – 7:45 pm, Durham, NC. The Academy for Spiritual and Consciousness Studies 42nd Annual East Coast Conference, “Aspects of Consciousness”. Dr. Bruce Greyson presented a talk titled “The Science and Spirit of Near Death Experiences”. May 21, 2017, 3:00 pm, Miami, FL. International Academy of Consciousness 2nd International Congress on Consciousness, Dr. Jim Tucker presented his research on “Children’s Reports of Past-life Memories”. March 22-23, 2017, Wake Forest University, Winston-Salem, NC. Beyond Being : Frontiers in Consciousness Research-Science, Spirituality and Wellness Description: When our physical life ends, does our consciousness end as well? Leading researchers in the fields of consciousness and neurobiology explored narratives of past-life and near-death experiences. The profound long-term impacts of these experiences were discussed along with the emerging research into a post-mortem existence. Panelists: Shamini Jain, PhD, and UVA DOPS researchers Kim Penberthy PhD and Ed Kelly PhD. Click here to watch the Video of this event on March 22nd, 2017. This special presentation of the research being done at DOPS is free and open to the public. The DOPS faculty who will be presenting their research will be: Jim Tucker, on children who claim to recall past lives; Bruce Greyson, on near-death experiences; Kim Penberthy, on meditation and altered states; and Edward Kelly on implications of this research for the relationship of mind and brain. January 21, 2017, Richmond VA. Central VA IONS Community Group, Meeting and 21st Anniversary event featured a talk by Edward F. Kelly, Ph.D. Program Title: Parapsychology in Context – Towards a Personal Reconciliation of Science and Spirit. The IONS 21st Anniversary Program will feature a talk by Edward F. Kelly, Ph.D., author of numerous scholarly works such as Irreducible Mind and Beyond Physicalism and Professor of Research at the UVA Division of Perceptual Studies (DOPS) in Charlottesville, VA.
January 10, 2017, 4:00-5:00 pm, Psychiatry Grand Rounds, Leonard Sandridge Auditorium in McKim Hall, UVA School of Medicine, Charlottesville, VA.
For this special Grand Rounds, the DOPS researchers presented their work to medical residents, faculty and staff in the department of Psychiatry & Neurobehavioral Sciences within the UVA School of Medicine. Dr. Jim Tucker presented on children who claim to recall past lives, Dr. Bruce Greyson presented on near-death experiences, and Dr. Kim Penberthy presented on meditation and altered states. September 17th, 2016 Boston, MA. Special Public Lecture Event presented by UVA DOPS Researchers and Tracy Coen at the Museum of Science, Boston, MA. Do We Survive Death? A Look at the Evidence: UVA Division of Perceptual Studies faculty presented their research into the nature of human consciousness. For this special event, they offered insights into their investigations of near-death experiences, psi phenomena, and children who remember previous lives. Check out our Facebook page for photos of this event and visit our Division of Perceptual Studies YouTube Channel to view the videos. The videos of the researchers’ lectures from this special event, were made possible through the generous support of Tracy Coen of Boston. In this video, Dr. Jim Tucker, author of Life Before Life and Return to Life and director of UVA The Division of Perceptual Studies, presents his research regarding small children who remember details of a previous life. He also offers some history regarding the founding of the Division of Perceptual Studies at UVA by Dr. Ian Stevenson. Dr. Bruce Greyson presents his research into near-death experiences in this video. Dr. Greyson is a highly respected researcher of NDEs, co-author of The Handbook of Near-Death Experience: Thirty Years of Investigation , our former director here at DOPS and he is the co-founder of the International Association for Near-Death Studies (IANDS). Additionally in this video, author Jeff Olsen relates his moving and profound near-death experience as a prelude to Dr. Greyson’s presentation. In this video, Dr. Kim Penberthy, Chester F. Carlson Professor of Psychiatry and Neurobehavioral Sciences, and the most recent addition to the research faculty at the UVA Division of Perceptual Studies, presents her research into mindfulness and altered states. Dr. Penberthy is interested in the relationship between mindfulness and other altered states of consciousness and the effects on our physiology. March 17, 2016, Charlottesville, VA. Virginia Festival of the Book- UVA DOPS Researchers presented at the 22nd annual Virginia Festival of the Book. 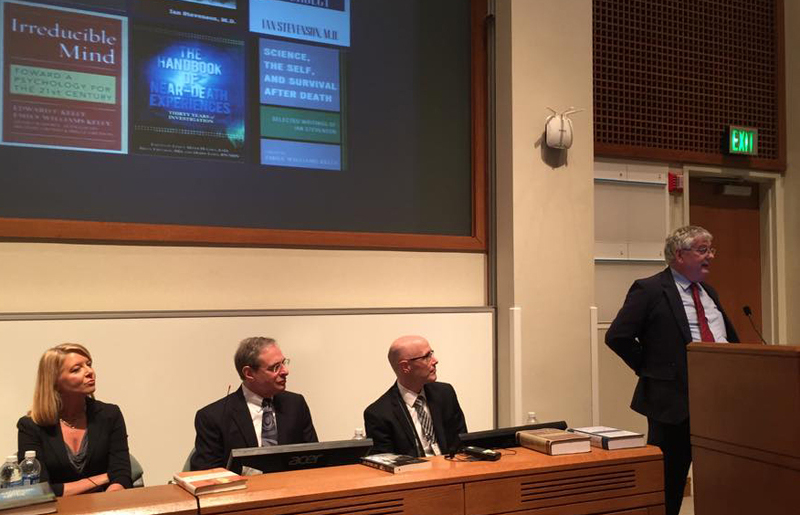 Authors Bernard Beitman (Connecting with Coincidence), Michael Grosso (The Man who Could Fly), and Edward Kelly (Beyond Physicalism) discussed their provocative scholarly books exploring unusual phenomena and applying theories from psychological, religious, and scientific perspectives. -Bernard D. Beitman, MD, (bernard.beitman@gmail.com) author of Connecting with Coincidence, is a visiting professor at the University of Virginia and the former chair of the Department of Psychiatry at the University of Missouri-Columbia. He has edited two issues of Psychiatric Annals devoted to coincidence studies. -Michael Grosso, (grosso.michael@gmail.com) author of The Man Who Could Fly, is a philosopher interested in altered states of consciousness and unusual psychophysical phenomena. A former university teacher, he is now an independent scholar and writer who researches human potential. -Edward F. Kelly, (ek8b@virginia.edu) author of Beyond Physicalism, and is a member of the research faculty in the UVa’s Division of Perceptual Studies. He served previously as lead author of the book Irreducible Mind, and he is working on intensive psycho-physiological studies of psi and altered states of consciousness in exceptional subjects. 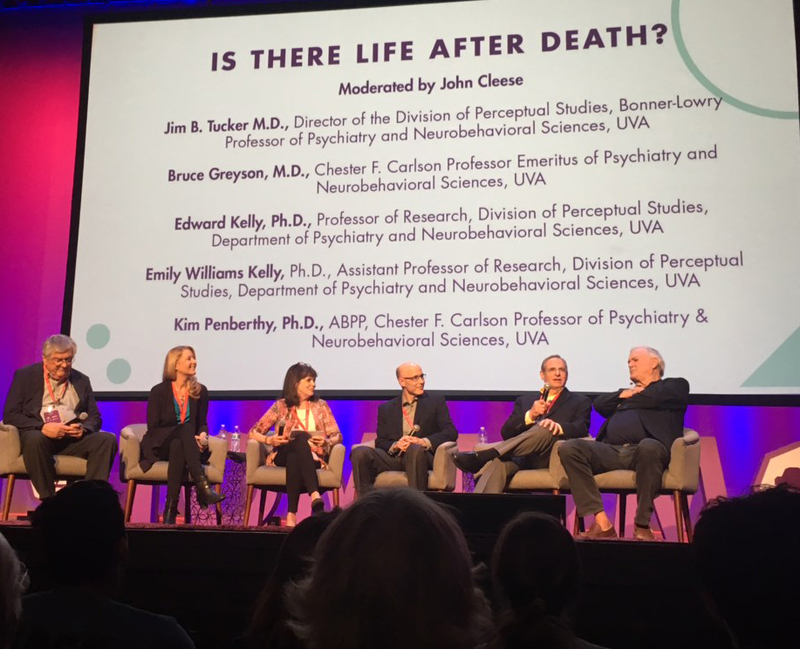 The discussion was moderated by Dr. Bruce Greyson, (cbg4d@virginia.edu), Chester Carlson Professor Emeritus of Psychiatry and Neurobehavioral Sciences at the UVa School of Medicine and Dr. Greyson is former director of the UVA Division of Perceptual Studies. Dr. Greyson is the co-editor of three books on near-death experiences and related phenomena including most recently, The Handbook of Near-Death Experience: Thirty Years of Investigation. March 5th, 2016, New York, NY, 6:00-7:30. Dr. Jim Tucker appeared with author Sharon Guskin at The Rubin Museum of Art, 150 West 17th Street, New York, NY 10011. Can consciousness continue after the brain stops working? Author Sharon Guskin’s striking debut novel The Forgetting Time is inspired by the real-life work of Jim Tucker of the Division of Perceptual Studies at UVA. Dr. Tucker joined Ms. Guskin for a conversation about the probability of past lives and reincarnation. This event was sold out. September 11-13, 2015, Tucson, AZ, Final Transition Conference-Science, Death, and Consciousness. Dr. Jim Tucker presented his research on small children who remember previous lives. September 3-6, 2015, San Antonio, TX. International Association for Near-death Studies, 2015 Conference. Dr. Bruce Greyson was a keynote speaker at this conference. His presentation was titled, “The Past Present, and Future of Near-Death Studies”. This presentation was a summary of Dr. Greyson’s perceptions of the past, present, and future prospects for near-death research. December 8-9, 2014, Dr. Jim Tucker travelled to Rio de Janeiro, Brazil to present his research into young children who report memories of previous lives at the Sociedade de Estudos Espiritualistas . November 8th-9th, 2014, Dr. Jim Tucker presented his research in Durham, NC at the Forever Family Foundation’s 8th annual conference: The Science of Survival of Consciousness. September 12-14th, 2014, Dr. Jim Tucker presented his research into cases of the reincarnation type at the Matter & Psyche Symposium, Joshua Tree, CA. Dr. Tucker gave a presentation as well as appeared on several discussion panels during the 3 day symposium. March 14th, 2014, 7:00 pm to 9:30 pm, New York Open Center, New York, NY. Dr. Jim Tucker offered an evening lecture and book signing. Return to Life: Reincarnation Research New Paradigms in Understanding Life, Death, and the Nature of Consciousness . March 15th, 2014, at 4:00 pm, The Powerhouse Arena, Brooklyn, NY. Dr. Jim Tucker gave a presentation and was available for book signing. Author Sharon Guskin also appeared on the program. February 16, 2014, at 3:00 pm, Barnes & Noble Bookseller in Greensboro, NC, Dr. Jim Tucker will presented his new book, Return to Life at this book signing event. January 16, 2014, at 6:00 pm, Barnes & Noble Bookseller in Charlottesville, VA, Dr. Jim Tucker presented his new book, Return to Life at this book signing event. December 15th, 2013 at 2:00 p.m., Jim B. Tucker M.D. appeared at The Quest Bookshop , 619 West Main Street, Charlottesville, VA to discuss his new book Return to Life . This event was free and open to the public. June 12th, 2013 at 10:00 a.m., Charlottesville, VA The Rutherford Institute Summer Speaker Series, Guest Speaker: Dr. Jim Tucker, Bonner-Lowry Associate Professor of Psychiatry and Neurobehavioral Sciences, Division of Perceptual Studies, University of Virginia. Dr. Tucker presented the research being done at DOPS regarding cases of the reincarnation type: LIFE BEFORE LIFE: CHILDREN’S REPORTS OF PAST-LIFE MEMORIES. For the past 6 consecutive years, Dr. Tucker has offered similar presentations regarding the cases of the reincarnation type to The Rutherford Institute Summer Speaker Series . February 18-19, 2012, Ligmincha Institute, Serenity Ridge Retreat Center in Nelson County, VA, New Dialogues Between Buddhism and Science This was a one and a half day conference with Geshe Tenzin Wangyal Rinpoche and academic presenters associated with the University of Virginia, New York University, University of Texas Medical Center. Tenzin Wangyal Rinpoche also participated actively in the dialogue, as well and led group meditation practice at various points in the program. Ed Kelly PhD, of DOPS, opened the discussion with a presentation titled “Framing the Dialogue”. His presentation focused on the history of modern scientific research on meditation. During this weekend event, researchers presented their work on the impact of contemplative meditation practice on behavior and the mind, as well as examined new areas of research to be explored between scientists and contemplatives. December 16-18, 2011, Dr. Bruce Greyson travelled to Dharamsala, India to present at the conference, ” Cosmology and Consciousness: A Dialog Between Buddhist Scholars and Scientists on Mind and Matter“. Dr. Greyson’s talk was titled, “Is Consciousness Produced by the Brain?” Click here to learn more about the conference and to view photos of Dr. Greyson presenting the DOPS research to His Holiness the Dalai Lama and to the monks of Dharamsala. February 25-27, 2011, Chopra Foundation’s Second International Symposium: Sages and Scientisits-The Merging of a New Future Dr. Jim Tucker presented research being conducted at the Division of Personality Studies regarding the investigation of cases in which children claim to remember previous lives. He will present new cases as well as cases he has written about in his book Life Before Life: A Scientific Investigation of Children’s Memories of Previous Lives . December 8th, 2010, 5:00-7:00, Live Teleseminar, Sponsored by the Institute of Noetic Sciences (IONS). Dr. Jim Tucker was the speaker on the teleseminar “Life Before Life” which is also the title of his book Life Before Life: A Scientific Investigation of Children’s Memories of Previous Lives . The host of the program is Marylyn Mandala Schlitz, Ph.D. In the interview, Dr. Tucker challenged the notion that consciousness is only the result of a functioning brain. He suggests that consciousness can be considered separately from the brain, which provides a basis for claims of reincarnation. He also discusses objections to reincarnation: the few persons who actually claim to remember a past life, the fragility of memories, the population explosion, the mind-body problem, fraud, and others. This was a live teleseminar. October 2nd, 2010, Serenity Ridge Retreat Center in Nelson County, VA, New Directions in the Dialogue between Buddhism and Science This was a one-day workshop with Geshe Tenzin Wangyal Rinpoche, founder and spiritual director of the Ligmincha Institute and the DOPS researchers. There was a guided meditations led by Tenzin Wangyal Rinpoche in addition to presentations by the DOPS researchers. A book titled Mind Beyond Brain was created from this collaborative event and published in October of 2018. In Mind Beyond Brain, neuroscientist David E. Presti, together with the distinguished researchers at the UVA Division of Perceptual Studies, engage in the exploration of how evidence for phenomena—such as near-death experiences, apparent memories of past lives, apparitions, experiences associated with death, and other psi or paranormal phenomena, including telepathy, clairvoyance, and precognition—can influence the Buddhism-science conversation. Presti describes the extensive but frequently unacknowledged history of scientific investigation into these phenomena, demonstrating its relevance to questions about consciousness and reality. These new perspectives offer significant challenges to dominant explanatory paradigms and raise the prospect that we may be poised for truly revolutionary developments in the scientific investigation of mind. 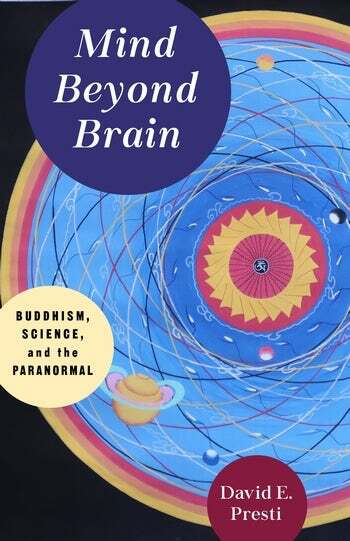 Mind Beyond Brain represents the next level in the science and Buddhism dialogue.